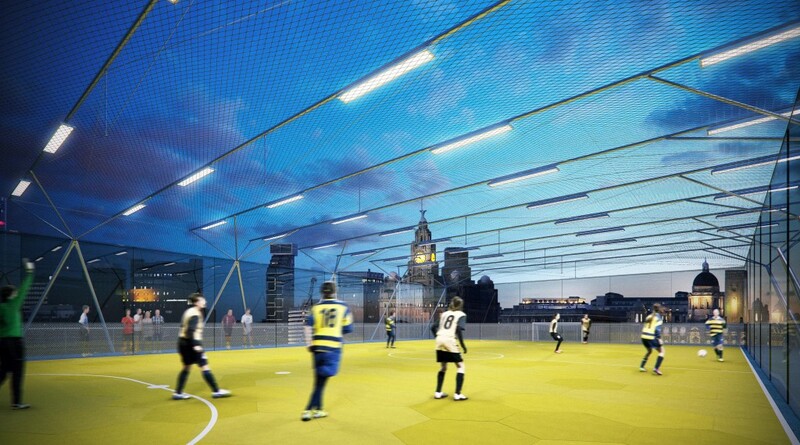 Maximiliano Arrocet and his colleagues at AL_A like to play 5-a-side football, which helps reinforce the family-like atmosphere of the London architecture and design studio. The employees found it more difficult to find a local pitch after the studio relocated. This spurred the question: How can a dense city with limited green space still cater to its active population? Working with engineering/design/planning firm Arup, AL_A unveiled its stackable football pitches concept in November 2016. The pitches, made of lightweight carbon fiber, would be easy to set up and transport. The stackable pitches could be used in a variety of locations from parks to building rooftops and more, for a varied amount of time. “[Carbon fiber] liberates you from all the traditional problems you have with buildings, such as that they have to be in a set place,” Arrocet says. While the concept utilizes limited city space, it also helps alleviate a growing global problem: obesity. According to the World Health Organization, world obesity has more than doubled since 1980. In 2014, more than 1.9 billion adults (18 years and older) were considered overweight; more than 600 million of those were considered obese. Arrocet says the stackable football pitches are just another step in the evolution of sports. He would know, having grown up in Madrid, playing football in the streets in between parked cars. Currently, a 1-to-1 mockup is being developed and will be tested to pass British standards. Arrocet hopes to have the project tested and greenlit within a year. The Cresta Run in St. Moritz, Switzerland, is unique for a variety of reasons. Although the naturally made toboggan run that was first started in January 1885 and is the birthplace of the head-first riding position has one head-scratching mark: women have been banned from riding the Run since 1929. The scene is the same. The clock reads 0:00. The final whistle blows. Some players jubilantly celebrate. Others fall to the ground in agonizing defeat. Confetti floats down from the rafters. There are tears of joy. Tears of disappointment. People are hugging in celebration. Some in reassurance. Amidst all the chaos, there are people running around from player to player and coach to coach handing out T-shirts and hats that proudly read "Super Bowl Champions".